Amazon claims that the new Kindle Paperwhite comes with twice the storage as compared to its predecessor and includes features such as glare-free display and a long battery life. 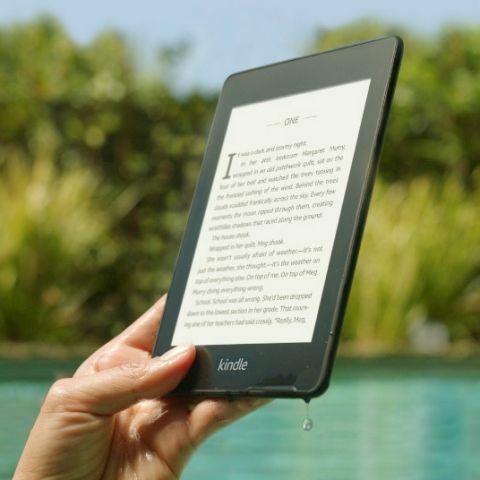 Amazon has introduced the next generation Kindle Paperwhite featuring a thinner and lighter design with waterproofing. The new e-book reader comes with twice the storage compared to its predecessor and includes features such as a glare-free display and a long battery life. It is now available for pre-order at www.amazon.in/kindlepaperwhite and is priced at Rs 12,999 for the 8GB Wi-Fi model and Rs 17,999 for the 32GB model with 4G. The company will start shipping the 8GB Kindle Paperwhite November 14 onwards and the 32GB model will ship in the coming months. For limited time, those who pre-order the e-book reader will get three months of Kindle Unlimited subscription for free. In addition to a free 3-month Kindle Unlimited subscription, customers can avail a two-year extended warranty for all pre-ordered devices. Amazon is also offering covers which open like a book and automatically wake the device up when opened or put it to sleep when closed. The rustic leather cover is priced at Rs 2,999 and other leather covers will be available at Rs 2,399, in Black, Merlot, Punch Red, and Indigo Purple colours. The water-safe fabric covers will be sold for Rs 1,799 each and will be available in Charcoal Black, Canary Yellow, and Marine Blue. “Our gold standard for Kindle continues to be a piece of paper. We are constantly improving the design to help customers stay immersed in the story. Today, we are excited to bring even more premium features - like a thinner and lighter flush-front design, additional storage, waterproofing - to our most popular Kindle,” Jayshree Gururaj, Director of Amazon Devices, said in a statement. The new Kindle Paperwhite features a back made up of soft, easy-to-grip material and the company claims that it is the thinnest and lightest Kindle Paperwhite yet, measuring 8.18mm thick and weighing 182g, which is said to be less than half the weight of many paperback books. The 6-inch display has a 300 ppi resolution. It also includes five LEDs and an adjustable front light for a glare-free display. It is designed to withstand accidental splashes in the rain, drops in the bathtub, hot tub, pool and beach. It is IPX8 rated and remains protected against immersion in up to two meters of water for up to 60 minutes. As mentioned above, the e-book reader now has 8GB of storage, which is twice the storage as the previous generation. There is a 32GB model for storing larger libraries. Amazon has introduced personalisation features in the new Kindle Paperwhite. There is an updated home screen which is claimed to make it easy for readers to find their next read. The suggestions come up based on a user’s reading history. Users can now save multiple reading settings, selecting the font, boldness level, and orientation settings. Users can also quickly switch between the main menu and the settings. The company announced that the updated home experience, as well as the ability to quickly save and access reading settings, will be delivered as a free, over-the-air updates to the Kindle Paperwhite Gen 6 (released in 2013). The latest generation of the e-book reader has Whispersync that saves and synchronises a user’s last page read, bookmarks, and annotations from Kindle eBooks across all the Kindle devices and apps.